The pattern and idea to make something so unique and custom really appealed to me. Love this concept. Chart is clear and concise. Can't wait to get started. Great pattern. Easy to read. Great price. I create patterns to help others tell their life stories through needlework. I've been cross stitching since grade school. After completing lots of projects from store-bought patterns, I decided that I wanted to create a depiction of my own life in fabric. It's kind of like a primitive charm bracelet. My original idea was to stitch a family tree, hence the name. After several friends contacted me about starting their own tapestree projects, I decided to make my patterns available for purchase. I hope needleworkers can use my ideas and run with their own interpretations, so that every project is unique and personal. My name is Rachel. I live and work in Pittsburgh. 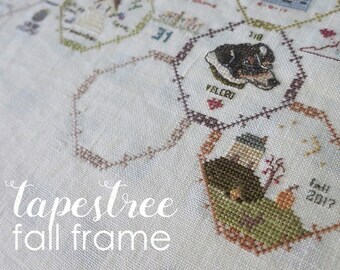 I created the tapestree project to provide a method for needleworkers to journal with needle and thread. 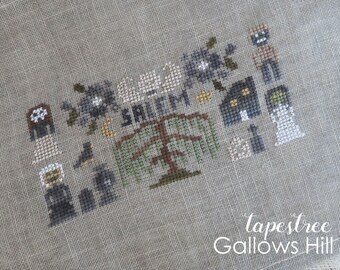 My blog (rachelpiso.com) chronicles the progress of my own tapestree. What supplies should I use? You should use the materials that you're most comfortable working with! Your tapestree project can be as large or small as you prefer. The patterns sold here are base designs to be incorporated into your overall project. How do I learn how to cross stitch?